There comes a time in the life of every career tile setter when he has to work on his own house. It’s not that tile professionals don’t like their homes to look nice; it’s just that most are reluctant to work when nobody’s paying them. I recently decided that pay or no pay my master bath was long overdue for an update, to include some work on the shower. I have for years wiped the tile dry after using the shower, and the tiled walls look good considering the 25 years they have been in service. 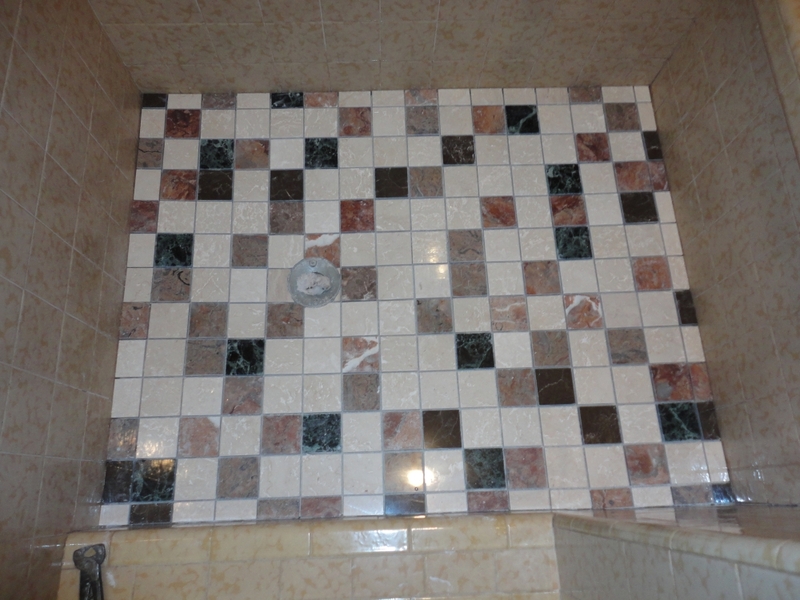 The tile on the shower floor, however, began looking a little tired several years ago and got progressively worse – to the point that I avoided looking down when taking a shower. No question that something needed to be done. I bit my lip and did it. I took pictures, and I’m going show and tell you how you can do it – for free. 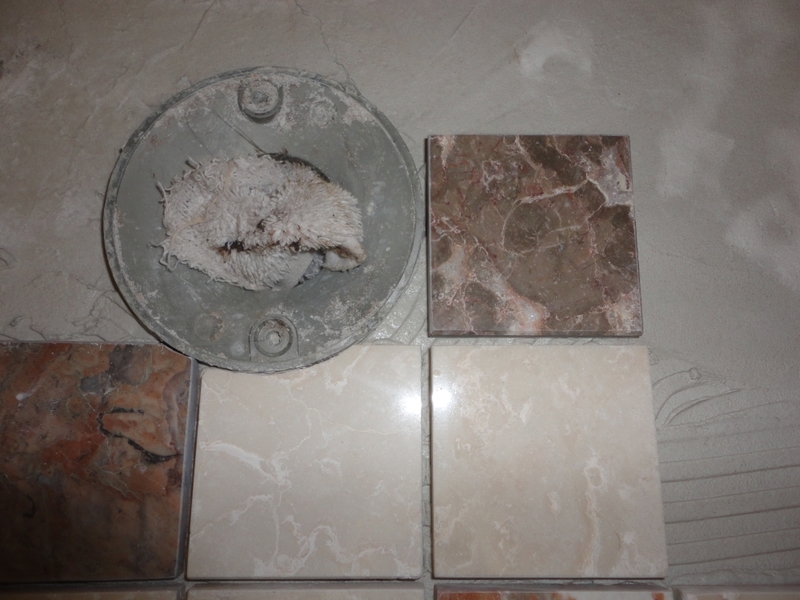 I figured I could strip the old tile off the floor and replace it without tearing up the mortar bed underneath. 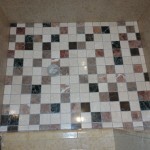 The only problem with this approach was that I wanted to use marble tiles that I had collected over the years. I would cut them into 3-inch pieces and mix the various colors into a blend. This would necessitate raising the drain since marble tiles are much thicker than the small mosaic tiles I had used when building the shower. 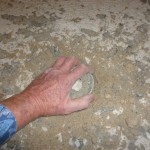 I would very carefully have to dig down to the base of the drain in order to free up and turn the threaded insert. One slip and I might penetrate the vinyl shower pan liner, which would bring on a much more extensive repair than I had in mind. 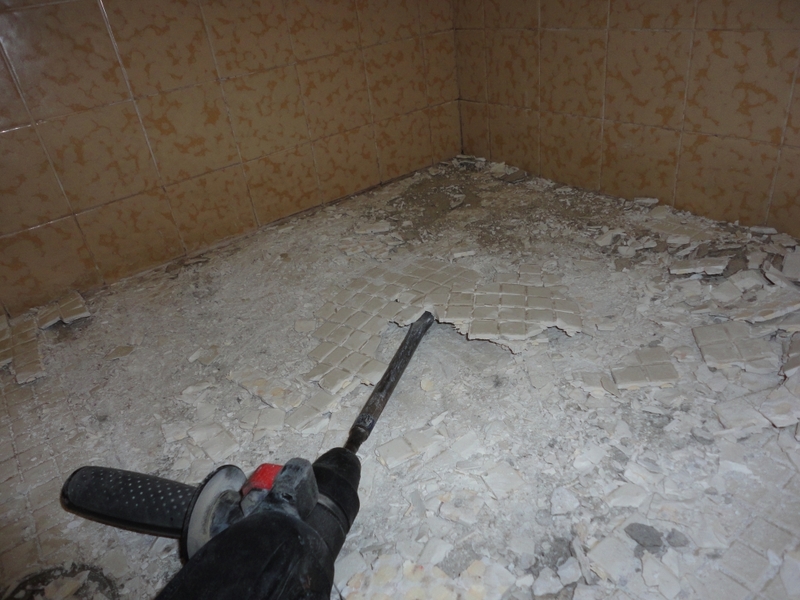 I began removing the tiles using a flat chisel, but the going was tough. So I hauled out my roto-hammer, and things went much better. Great caution must be taken when using a power tool on a shower floor lest you burrow down through the mortar and make a hole in the pan. 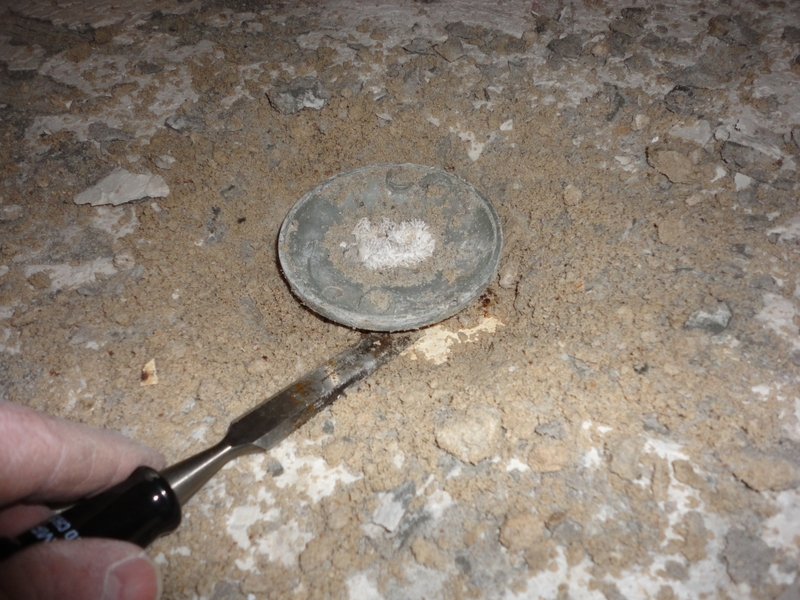 I kept the angle of the tool close to parallel with the surface of the floor, and ten minutes later I had the entire surface cleared. 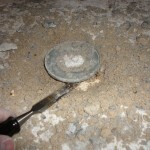 I now began to excavate the drain using an old blunt wood chisel and a hammer. The clamping ring on drains used on conventional tiled showers is wider than the grate, so if you angle your chisel inward toward the drain there is little chance of driving it into the liner. The chisel won’t penetrate the clamping ring. Still, caution must be taken. 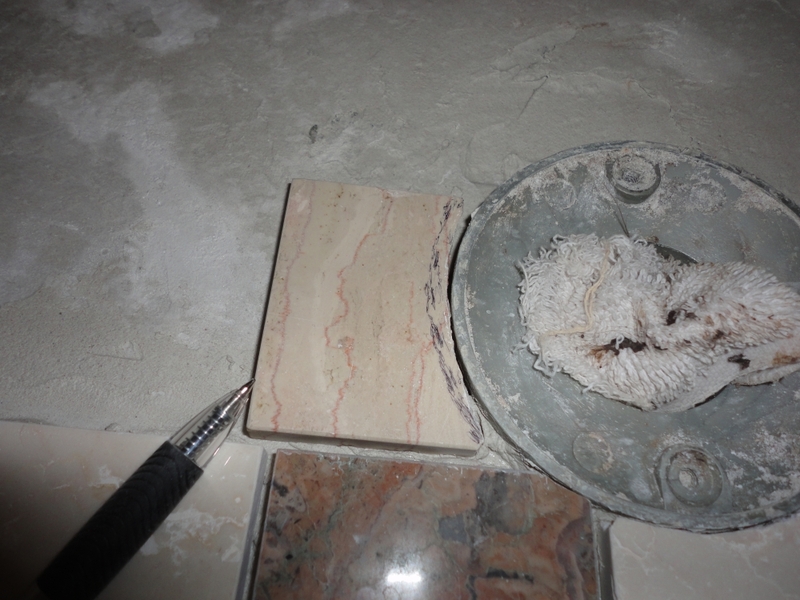 It didn’t take me long to chop through the mortar to expose the inward portion of the clamping ring, which was covered with small tile scraps years ago when I had built the shower. 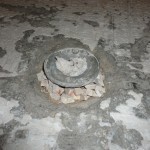 The tile scraps are used to keep the floor mud away from the weep holes in the base of the drain. I removed the loose material and began tapping on the rim of the insert with the handle of my margin trowel in an attempt to free up the threads. It took a while, but I was eventually able to turn the insert with my hand and raise it about three-eighths of an inch, enough to accommodate the thicker material I intended to use as floor tile. I had previously sawn my stock of marble tiles into 3-inch squares and sanded the edges of each piece to remove the sharpness of the cuts. I used a couple of the pieces as gauges to make sure I had the insert high enough. 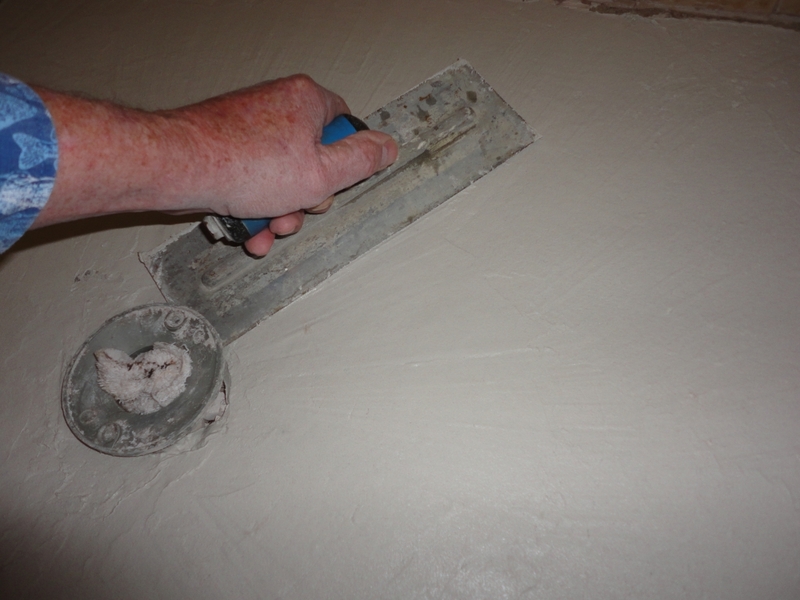 Thin set mortar, normally used as a tile adhesive, is a good material to use to smooth the surface of the mud bed. 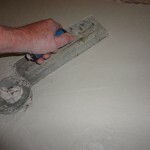 Mix the material fairly stiff and skim it over the surface with a flat steel trowel. Take your time and get the surface as smooth as possible. 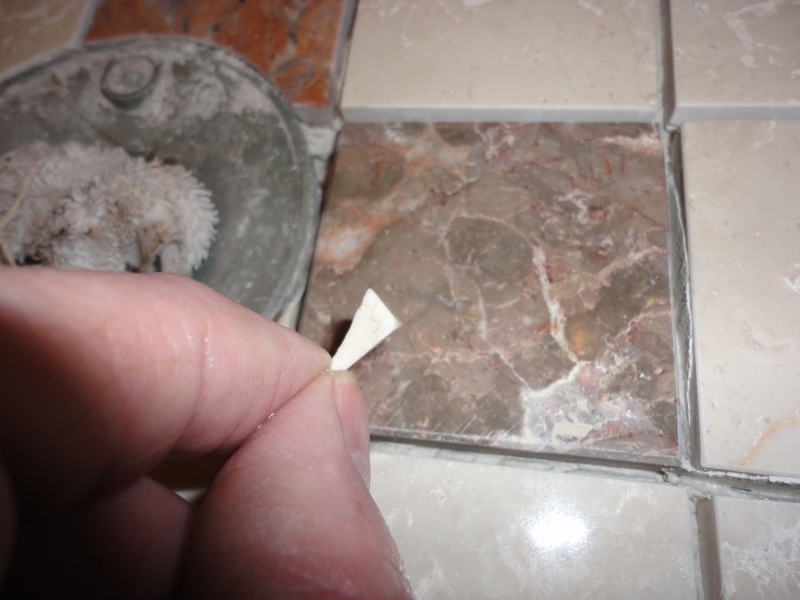 Prior to filling in around the drain I spread a handful of tile scraps to keep the thinset away from the weep holes. 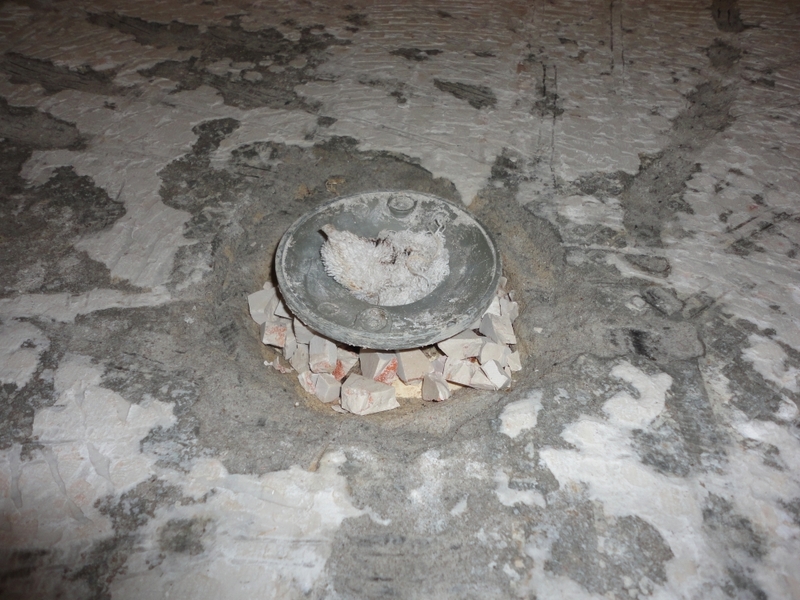 When the shower is used, what water that might get through the tile and mortar bed must be able to make its way down through the weep holes. 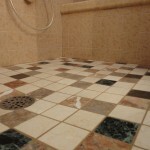 Otherwise, the shower floor can become swamped with brackish water, causing dampness, mold and in extreme cases a very offensive odor. To ensure that the thinset wouldn’t ooze through the tile scraps I pushed it in toward the insert very gently. 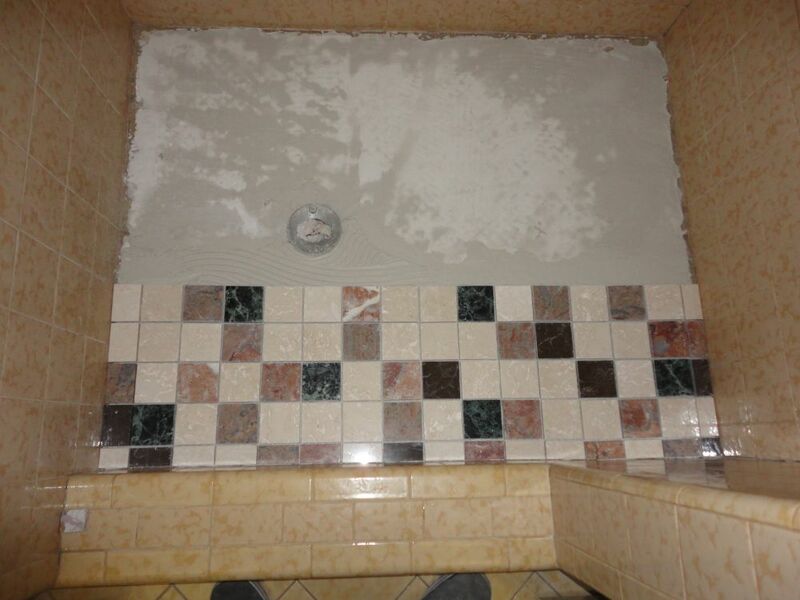 I would fill the hole the rest of the way when I set the new tiles. I went over the surface a final time with the flat trowel and left the surface to harden overnight. The next morning I laid a row of tiles on the bathroom floor so that I could measure them and figure my layout. I discovered that full tiles wouldn’t quite reach wall to wall in the long dimension of the floor, so it would be necessary to make cuts on both ends. It would also be necessary to make cuts in the short dimension. I laid a row of half tiles on the inside of the curb and used them as my starting course. I installed several courses of tile and made all the end cuts. It was time to start cutting in the drain. 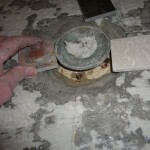 You must have a tile saw when installing marble or any stone tiles. 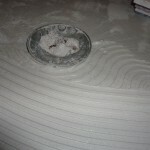 You cannot make straight cuts in stone using a snap cutter. Also, it is just about impossible to cut around a shower drain with anything other than a wet saw. 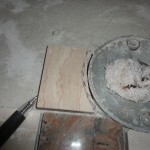 Some of the cutting might be made with biters, but you’ll break many tiles in the process and still need a saw to make some of the cuts. Get a saw. 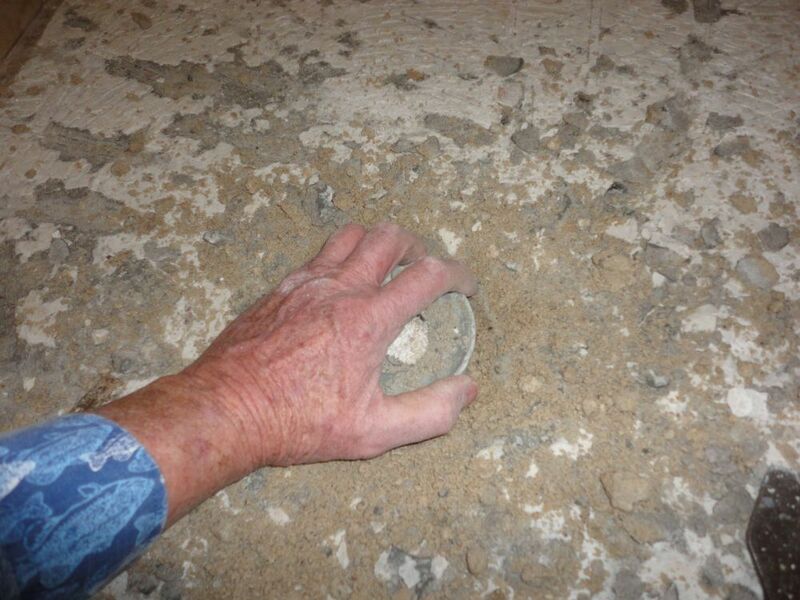 A question might arise as to whether the entire field of tile might be laid with the drain cuts installed last. The answer is no. The drain cuts must be made and installed as you go in order to make sure that all the tiles in the vicinity of the drain are at the correct height, and also that they are at the correct pitch to the drain. 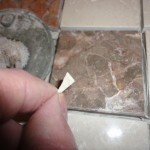 Although hand tools don’t generally work on marble tiles, you can use nippers for drain cuts that are very shallow. I was able to make the first two cuts with the nippers, saving several trips out to the wet saw. For the deeper cuts I sawed into the pieces and broke the waste out being very careful not to go too deep. With a little nipping and numerous trips to the saw the succeeding pieces were prepared and set. I used a piece of tile to help get the pieces at the right height and pitch. I wanted the cut edges to end up slightly higher than the rim of the drain. 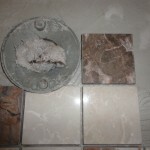 Because my stock of 3-inch tiles came from different varieties of marble they varied in thickness considerably. This was especially true of the pieces cut from my supply of green marble. To compensate for the variance I buttered extra thinset on the backs of the thinner tiles and set them in place using a scrap of tile to level them up. 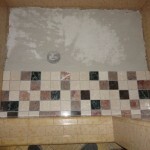 I completed the tile field at the right of the drain and began working my way to the left. 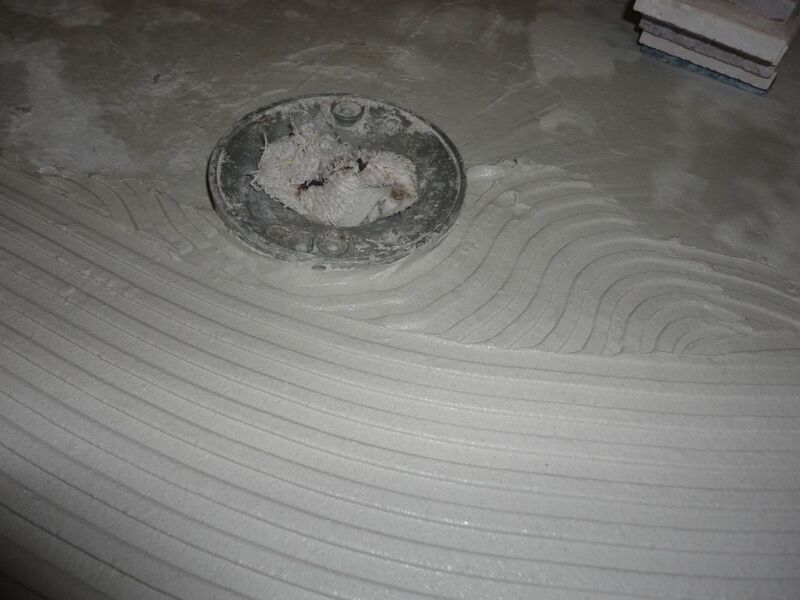 The right side of the drain required two very small slivers of marble that were painstakingly made with the wet saw. And finally, I completed the remaining area of the floor. I now ran my hands over the entire surface to detect lippage that I might have overlooked when setting the tiles. Lippage is the term for the difference in height between one tile and another. I removed and re-set offending tiles, keeping in mind that zero lippage is not attainable due to the dish shape of the shower floor. The corners of all the tiles will display some lippage. I then checked for excessive thinset, making sure there was none in the top two-thirds of the joints. 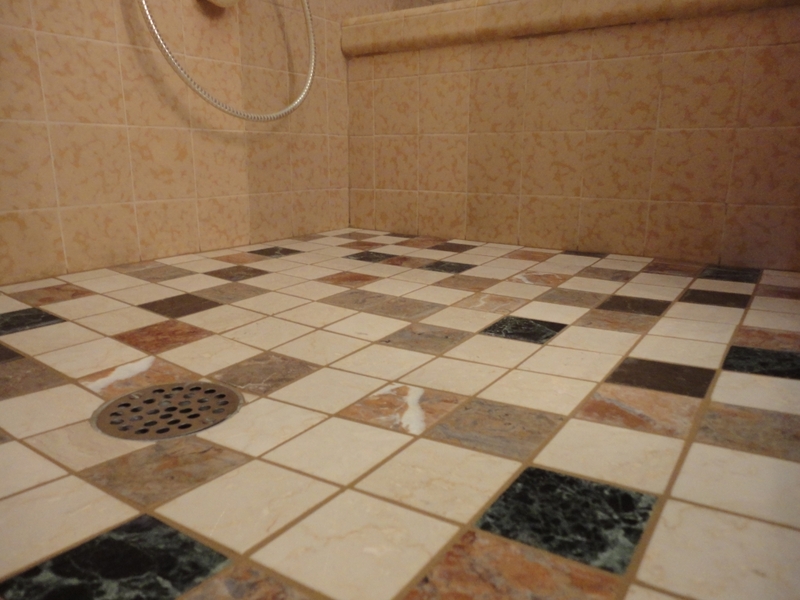 Excess thinset can cause discoloration in the grout. I also made sure there was no thinset residue on the surface of the tiles. Marble tiles cannot be cleaned with acidic cleaners as can ceramic tiles, so it is imperative they be thoroughly cleaned as they are set. Grouting is routine. My tiles were set about an eighth inch apart, and I decided on sanded grout even though sanded grout can scratch the surface of marble tiles. As I spread the grout I avoided pushing hard with the rubber float, and I limited the number of passes I made over the surface. There would be minor scratching, but it would not be visible. I would never use sanded grout on a larger marble tile job, though. 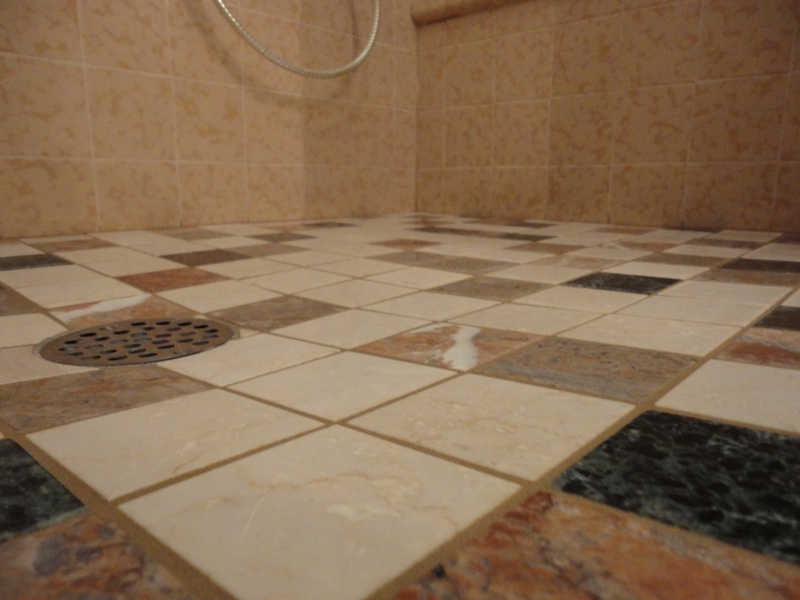 If you are concerned about minor scratching, you can use unsanded grout. 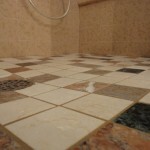 You will probably have to grout twice, though, as the grout will tend to wash out of the joints the first time around. 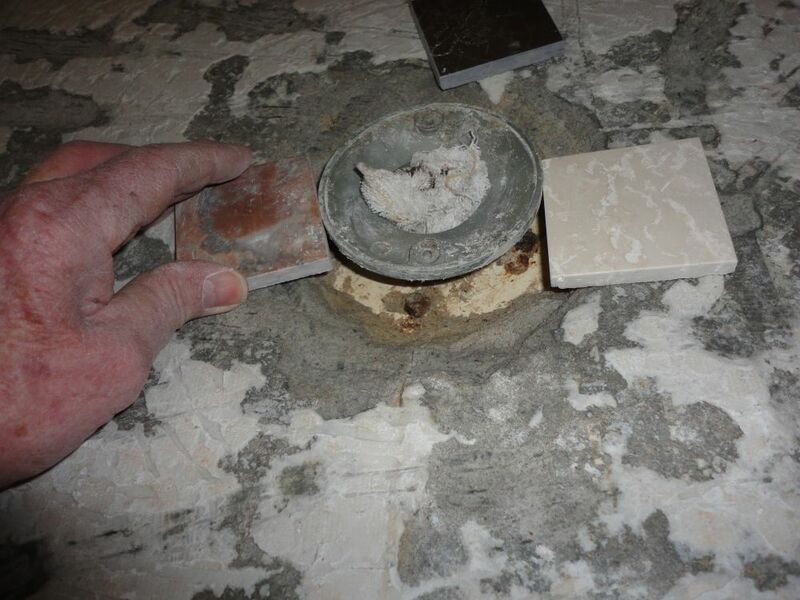 Allowing the first grout job to partially dry (and thoroughly cleaning the surface) and adding a second layer will bring the joints close to the surface of the tiles. Make sure you clean the surface completely before you walk away from the job. Allow the surface to dry when you think it’s clean. You’ll see a slight haze that must be buffed off with a dry rag. Don’t omit the buffing step. 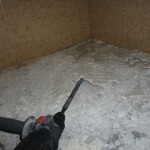 Allow the floor to dry overnight and then seal it with a good penetrating sealer. A very good one is available at Lowes and Home Depot. It’s called Miracle Impregnator Pro 511. Apply it with a small sponge, allow it to “dwell” about two minutes and buff the surface with clean rags or white paper towels. 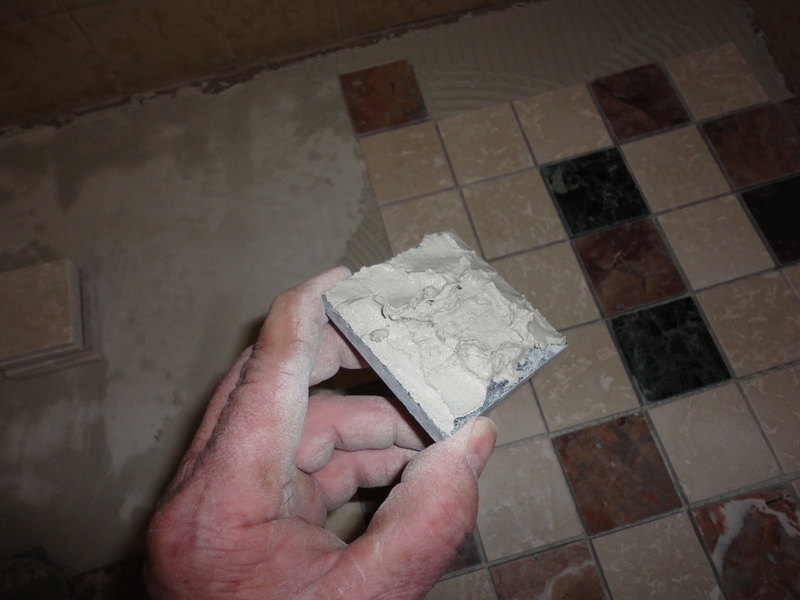 Make sure you remove all traces of the sealer from the surface of the tiles. Enjoy your new shower floor. 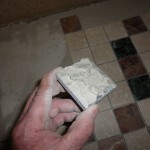 If you have any questions about this or any other tile project, you can ask them at the John Bridge Tile Advice Forums.